Today is Candlemas, the 40thday after the Nativity. Its liturgical origins are obscure, but its blazing processions of candles in the winter dark not only made a glorious end to the extended Christmas celebrations of less hurried times, it also provided a brilliant preview of the resurrection fires of the Easter Vigil. Although it still may allow, for a few liturgically-minded procrastinators, a generous extension of the deadline for boxing up our holiday decorations, Candlemas is rarely observed in American homes and churches. Our minds are fixed on groundhogs and football, not the Presentation of our Lord in the Temple. 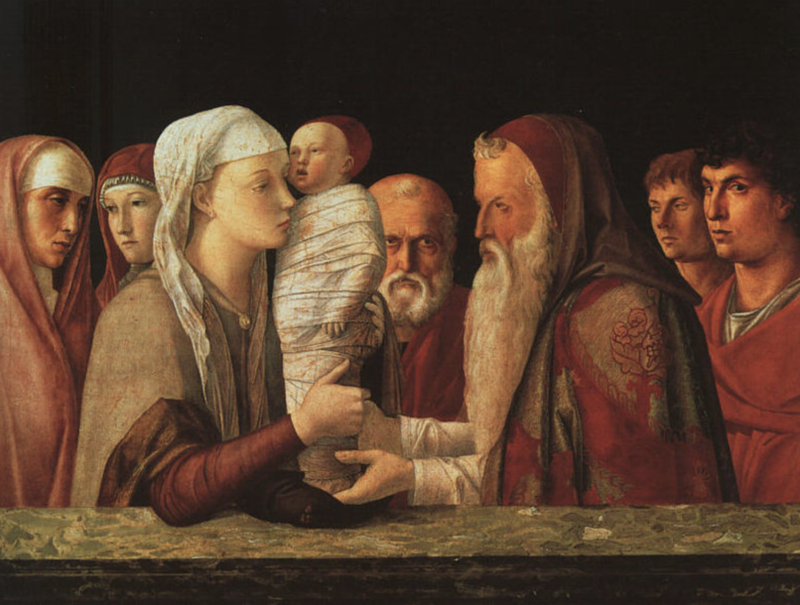 In the Eastern churches, Candlemas is called “The Meeting,” highlighting the moment when two old souls, Simeon and Anna, met the One for whom they had waited all their lives. Simeon had been told “by the Holy Spirit” that he would not see death before the coming of the Messiah. Every time he went to the Temple, he wondered, “Could this be the Promised Day?” Whatever he may have imagined––the House of God filled with smoke and shining angels, a mighty king arriving in noisy triumph––the long-expected day arrived like any other, without the slightest fanfare. Simeon liked to go to the Temple early, when it was still blissfully quiet and uncrowded. He began his prayers as usual, but his attention wandered when the entrance of a young couple and their baby caught his eye. He could tell they were country people, the way they looked with such amazement at the vast interior. As they passed by him, he smiled kindly, then closed his eyes to resume his prayers. But everything within him shouted, “Look! This is the time. Don’t miss it.” As soon as he opened his eyes again, he knew. He didn’t know how, but he knew. That child, cradled in the arms of a peasant girl, was the One! Then Anna, the old prophetess who had camped out in the Temple for many years, stepped out of the shadows to add her own confirming praises. Joy to the world, the Lord is come! I whisper over to myself the way of loss, the names of the dead. One by one, we lose our loved ones, our friends, our powers of work and pleasure, our landmarks, the days of our allotted time. One by one, the way we lose them, they return to us and are treasured up in our hearts. Grief affirms them, preserves them, sets the cost. Finally a man stands up alone, scoured and charred like a burnt tree, having lost everything and (at the cost only of its loss) found everything, and is ready to go. Now I am ready. It is a custom at Candlemas to bless the candles for the rest of the year. In 2003, I happened to be in London’s Cathedral of St. Paul for a similar rite, when members of the Wax Chandlers Livery Company, in a practice dating back to the fifteenth century, brought long candles to be blessed for their service on the high altar. A candle is a temporal thing, fulfilling its function of radiance and warmth at the cost of its own vanishing. Even so, the fire that consumes it bears Love’s name, and does Love’s work. Whatever is offered up shall receive its true being. Whatever is lost shall be found anew. Fire of heaven, make us ready.